Look at the tree from a distance to get a feel for it as a whole. A tree’s lean will often be more evident seen from afar. Branches that are broken or split might be more readily seen, such as the crack in a major leader (right). Sometimes branch angles will look out of place or unusual. Power lines are often seen more clearly from a distance. You could very well choose not to go anywhere near a tree such as this one if you see obvious signs of danger. The ground zone includes the area around the base of the tree and three feet up the trunk. This includes the ground close to the trunk, the tree’s base, and its root flares. Watch your step! You may not think it is dangerous to walk up to a tree until you step on a yellow jackets’ nest in the ground, twist an ankle on a hidden hole, or walk through poison ivy. Pay attention to where you are putting your feet! Don’t get a case of “tree hypnosis” as you walk toward the tree: stop when you look up. The ground zone can provide valuable clues to serious tree problems. 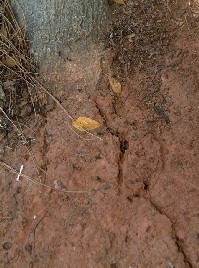 Raised or cracked soil (right), especially on the side opposite a tree’s lean, can indicate a tree in the process of uprooting. Sometimes putting your head close to the ground for an “ant’s eye view” can give you a clearer perspective of ground swellings or roots heaving upwards. Be wary if you see dead branches lying on the ground. It’s a good bet there will be more of them up in the tree. Step away from the tree and look up again. Use binoculars from a safe distance to get a closer look. A tree is supported and held up by its root system. There are two types of roots. The supporting or anchoring roots are the most visible. They hold a tree in the ground, and serve as storage containers for sugars produced through photosynthesis. The absorbing roots are tiny root hairs that can exceed thousands of miles if the lengths were added together. Their function is to pull water and nutrients from the soil. The presence of fungus on or near a tree trunk points to root decay and trunk rot. Stay away from a tree if you see profuse fungal (mushrooms-like) growth around the root flares or trunk of the tree. Fungus only grows on decayed wood, and is particularly serious if it is profuse. (The tree at right has a very bad case of ganoderma.) If the anchoring roots decay and rot, the tree can still appear healthy and fully clad with foliage because the tiny absorbing roots are still actively supplying the tree. However, if the anchoring roots that hold it up are no longer providing support, a gentle wind or even rainwater sitting on the leaves can cause the entire tree to topple without warning. Look at the base of the tree and up three feet (1 meter). A tree with a cavity has lost strength. Use a stick to probe a cavity opening to get an idea of how deep it is. (Never stick your hand into a cavity because wild animals often live there and you could be bitten.) Larger cavities signal a larger strength loss. Tall trees with cavities are more dangerous than shorter trees with cavities because of the increased leverage factor wind places on them. A tree is much more dangerous if there is more than one cavity opening at its base. The presence of a cavity does not always mean the tree is unsafe, however. 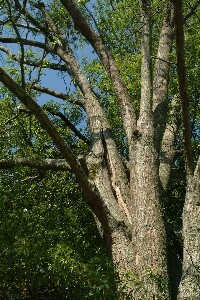 This depends on how extensive the cavity is, where the tree is growing, and the general overall condition of the tree. Unusual bulges indicate a tree is trying to compensate for a loss of strength by adding layers of growth. Cracks and splits in the trunk are more serious and point to the possibility of the tree breaking.